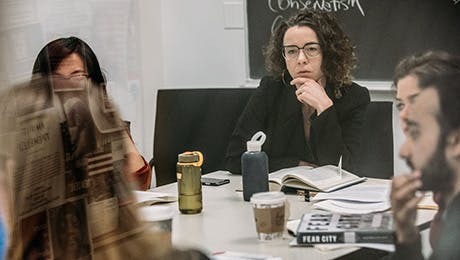 Students from the Economics department are leaders in the modern interpretations of historical ideas, with an emphasis on application to contemporary policy debates. With a strong foundation in both economic theory and hands-on critical engagement, students continue to work and learn at prestigious private firms and academic institutions worldwide. Our MA students have pursued PhDs at top institutions like Vanderbilt University. Most choose to continue their studies at The New School for Social Research. They have also found employment as policy analysts, researchers, lecturers, and leaders in local and national governments across the globe; in the UN and the World Bank; at universities and think tanks, from Hunter College to the Institute for New Economic Thinking; and in companies such as Chobani and BDO. Our doctoral students are working in positions throughout the academic world. They have also found employment in organizations, governments, and companies across the globe.